All 112 offences took place in the UK. DUNDALK MIDFIELDER CONOR CLIFFORD has been handed a six-month worldwide ban from football for ‘betting offences’. The FAI confirmed the news in a statement released this evening. The 26-year-old’s suspension began on 3 October and will run until 2 April next year. The offences were committed in the UK and subsequently investigated by the Football Association, who charged Clifford with 112 breaches of the FA’s E8 rule, which relates to betting. Clifford, who admitted the charge, was also fined £600 by the governing body. Fifa informed the FAI of the ruling earlier today. The Dublin native was captain of the Chelsea FA Youth Cup-winning team in 2010 but never made a first-team appearance. After a litany of loan deals, he finally left Stamford Bridge in 2013. He spent a very short time at Leicester before two years at Southend. 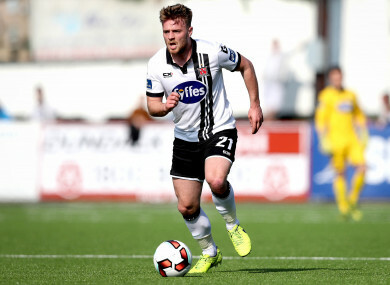 In 2015, he dropped to the Conference and signed for Boreham Wood before returning to Ireland and joining Dundalk in January. That month, in an interview with The42, he described his time in non-league football as a mistake. Dundalk have released their own statement, revealing Clifford placed the bets during an ‘unhappy period’ of his career, while they also say there’s ‘no suggestion’ Clifford has committed any gambling offences since arriving at the club. Email “Dundalk's Conor Clifford handed six-month worldwide ban for 'betting offences'”. Feedback on “Dundalk's Conor Clifford handed six-month worldwide ban for 'betting offences'”.